You know the drill, you worked all day, maybe got home a little late because you had to pick up the kids at soccer practice and now they are hungry and you have no idea what to make. Maybe you simply got home feeling tired and not in the mood to figure out dinner so you run out to grab takeout and then feel guilty later that it wasn’t a healthy choice for you or your family. I have been there and done it all. It got so bad for a while that B and I were hardly cooking at home anymore because it was easier and less stressful to just grab something instead of coming home to stare at the frig or the cupboards for 30 minutes trying to figure out what we can make that wont take 2 hours. After is became the norm to eat out instead of the exception, I decided it was time to make a change so I started meal planning and it has changed our weeknights completely! When I first got started, I honestly thought I’d never have time to plan meals every week. 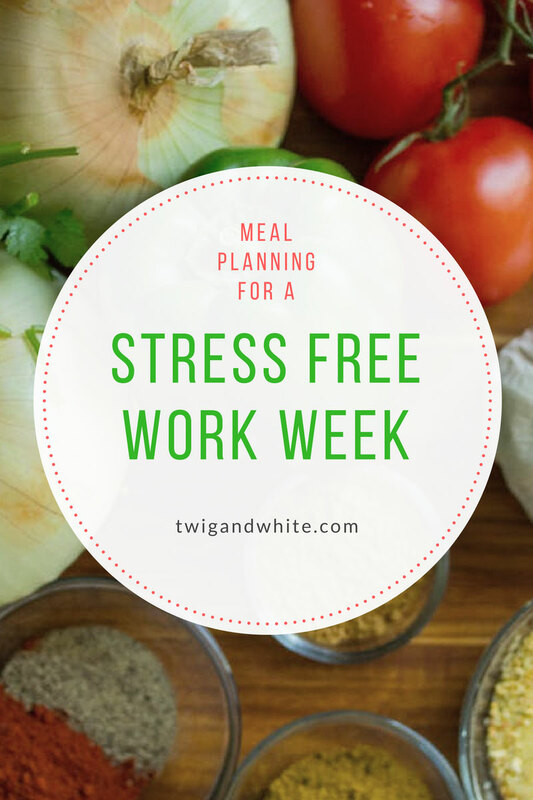 I feel overloaded with running a business and keeping up with the house as it is but when I figured out planning our meals every week doesn’t have to be time consuming or even more stressful, things changed completely. There is no set way to do this. You really need to figure out what is going to work for you so that you can maintain the habit. Below is my step-by-step process. I usually plan my meals on Friday evening or Saturday morning because our usual routine is hitting the grocery store on our way home from Church on Sundays. Before I plan any meals for the week though, I take a look at our calendar for the upcoming week. I also ask B if he has any meetings that will keep late any of the nights. Considering this ahead of time allows me to plan quicker meals or solo meals if we have something going on a certain day or if B is going to be late getting home. I have cookbooks, Pinterest boards and recipes from HelloFresh that I refer to and I plan meals according to the day. If B had a meeting one night, I’ll plan something simple for myself or if we have a night we have plans, I’ll make it a quick and easy night. I make a shopping list in a notebook that I keep specifically for this purpose. I don’t typically fill in my menu right away. I write down all my ingredients even if I know I already have something. Once that is done, I go back to my menu and fill in the names of each meal making note on the following day’s lunch if there will be leftovers or not. I do try as much as I can to plan meals that will provide leftovers for a lunch to follow. This saves money and time so that we aren’t buying extra items for lunch or going out to eat. Once I have my dinners filled in with lunches, I’ll then add to my shopping list anything else that we may need for breakfast, extra lunches, etc. Then I’ll fill them in on my menu until I have everything filled up. Once my list is complete, I’ll go back through my shopping list and cross off anything we already have. Sometimes I actually have to go through my cupboards or pantry to confirm what I need or don’t need but this usually takes just minutes to do. My menu for the week goes right on the frig so it’s always in view. When I’m getting around in the morning it serves as a reminder to get the CrockPot going or get meat out to thaw. It also saves me time in the evening because I already know what’s on the menu. Even when I have had a long day, I am able to get a good meal on the table because I did a little extra work ahead of time. This has take so much stress out of my weeknights! Because I have already made a shopping list, on Sunday after church we are ready to hit the store. Our list keeps us on track which has saved us a lot of money and time. We only need to go down the isles that have items we need and we aren’t buying a lot of extra stuff that we don’t need. Whether you find that a different process works best for you or you like my process, putting in a little extra time at some point in your week to plan ahead will most definitely relieve some stress from your weeknights. You will no longer get home and wonder what you can make for dinner because you have already planned ahead and maybe even done some prep. 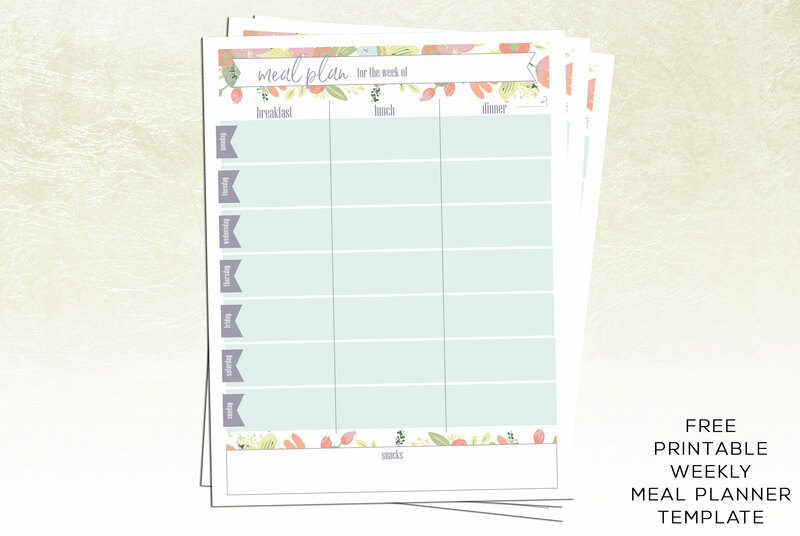 To help make your meal planning go a little easier I have designed a great weekly meal planer template that you can download for free and print out yourself to use. Print as many as you’d like!